I have just discovered Lunchbots! Do you know them yet? They’re little stainless steel food containers which are completely BPA-free and eco friendly and eliminate the need for plastic baggies and other waste. They come in different sizes and with different divisions, so they’re handy for littler snacks or for a bigger meal. Great for inside lunch boxes, for after school snacks, for car rides or airplane journeys, etc. And the best part is that they’re dishwasher safe, so easy to clean! They’re available in the UK from Little Acorns To Mighty Oaks. 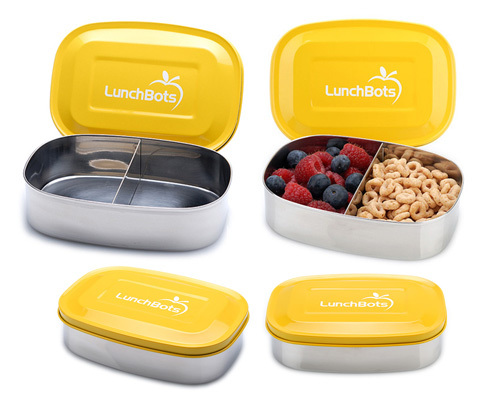 I’ve had my lunchbots for almost a year and can totally vouch for them – they’re awesome. I get asked about them almost every time I pull them out at the park. The ones with separators are especially great. A 'One Pot Wonder' recipe -- a video with Abel & Cole!